The new-look Bondi Vet is heading to Nine, expected to screen on Friday nights. 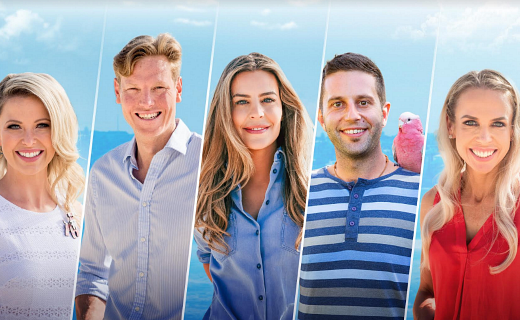 The revamped series, which follows a talent hunt by producers WTFN, features Peter Ricci, Alex Hynes, Kate Adams, Lewis Hunt and Danni Dusek. WTFN’s CEO Daryl Talbot says “Steve Oemcke and I created Bondi Vet to appeal to audiences in Australia and abroad. WTFN has wrapped the year with hit series Paramedics on Nine and The Living Room on 10, both amongst the networks’ respective ratings successes in November. “For producers, TV is all about timing,” says WTFN CEO Daryl Talbot. “Steve and I first pitched Paramedics to the networks at the beginning of 2016, but we just couldn’t get the series across the line. “Adrian Swift at Nine loved the idea and loved the cast of Paramedics, and kept pushing it forward until it became a reality. “It’s seven years since Steve and I originally created The Living Room but the formula is as strong today as it was back then,” he continued. I can’t believe it. The same old reality shows wheeled out again next year. I guess there’s nothing new under the sun. To be known as Bondi Vet: Coast to Coast. Didn’t know we had nothing but great looking vets in this country, you know…the ones who look great on tv… None of them obviously come from our area, ours are just ordinary everyday looking people. To me it sets unrealistic ideas that all Aussies look like this. Those are unfeasibly good looking vets. Will they still pretend it’s Bondi? Was there any point in even including the name Bondi in its title, considering how little of it was filmed there? Fun Fact about Vet #2: He came runner-up in a Conan O’Brien look-a-like contest. Actually it is Conan O’Brien…. Looking for his next laugh. I personally think this style of show has run it coarse. Great for a fill in show or on a lifestyle channel. Wow. It’s 2018 in Australia. Heard of diversity? Oh come now, there’s a wide variety of blonde going on here!